Amoeba’s face was swallowed by a shadow that didn’t seem quite so menacing in person. 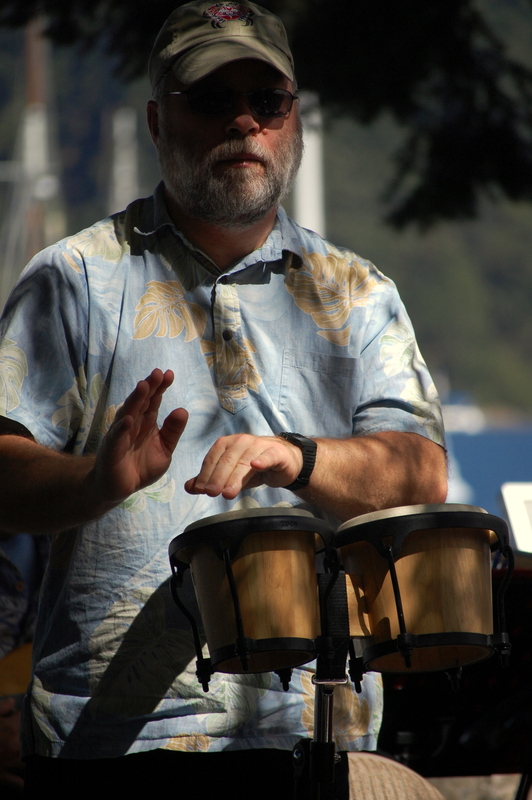 This photo was taken during a One More Time Band concert at the Port of Friday Harbor. Here’s a short vid of the band in action. Bring earplugs. Thom, the singer’s husband had the camera and two very active children, one of which frequently used his leg as a jungle gym — while he was perched atop a rock wall as close to the stage as he could get without standing in the middle of the sidewalk, which actually is BETWEEN the bandstand and the audience. Of course, since the entire park is maybe ten feet wide, they’d be pretty hard-pressed top put the sidewalk anywhere else …..
Oh, as for the ear plugs, Jill, the singer, is doing a great job of distracting you from hearing (not hearing) the missing instruments in the band. I have more muffed than not, and I post them all the time! Logo — I have much more muffed shots, too. stay tuned for next week! Thom — Amoeba never smiles when he’s playing. Makes me wonder if he’s really enjoying himself. I think it makes him look mysterious . . . even your ‘muffed’ shots look good, Q! Kelley — not all of my muffed shots look good, trust me. And an Amoeba capable of playing brass horns and bongo drums is a bit mysterious, I think. Mama Zen, beware the shadow …. Shadows do add to the mystery. I like it. Even if it´s muffed. Enjoyed the video too!